I’m currently enrolled in an online class through Whipstitch on summer dresses. I’m loving learning some new skills and sewing things for me for a change. I ended up adding a lining to the skirt of this baby doll dress. In hindsight I don’t think I needed to but it was good practice for me. 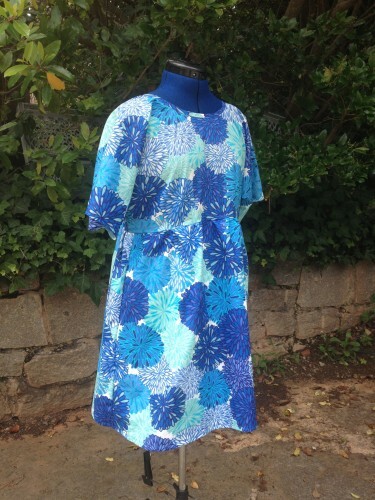 The dress is fun and summery and flow-y and I’m going to enjoy feeling relaxed and comfy in this dress. I’ve also been on a bag kick. 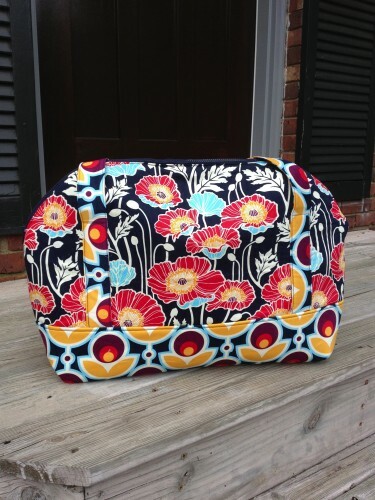 I’m getting ready for some summer travel and I’m super excited to have some new luggage to carry all my goodies. No one’s going to mistake these bags for theirs at the airport!! 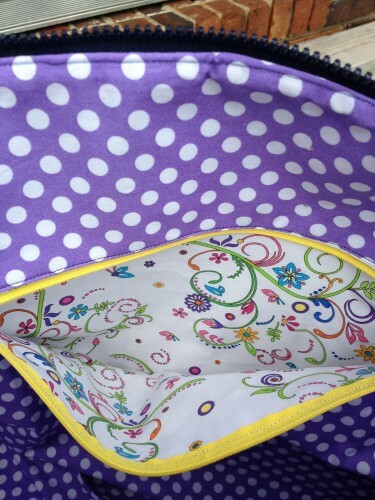 I’m loving the purple polka-dot interior with colored zippers and fun pockets of the Aeroplane bag on the bottom. While most people won’t see that, I’ll know it’s there and know the pop of color surprise is in there for me! 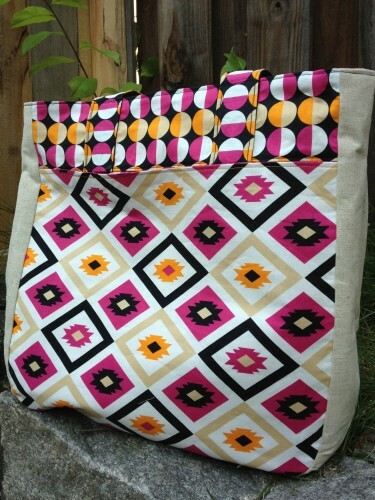 I feel like both of these bags are fun colors and will bring some sunshine to my life. I recently finished a custom order for someone in honor of 3 sisters. 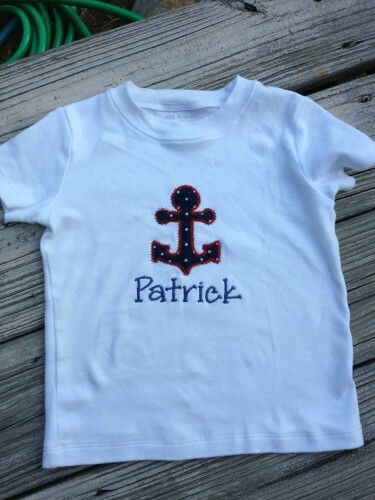 I’m used to sewing clothes for smaller kids and I couldn’t get over how large a size 10 shirt is! I can’t imagine that Courtney’s ever going to fit in something that big but I imagine that day will be here before I know it (insert sad face here)! This picture is no good so while you can see the design, you can’t tell how awesomely vibrant the colors are or how cute they are too. 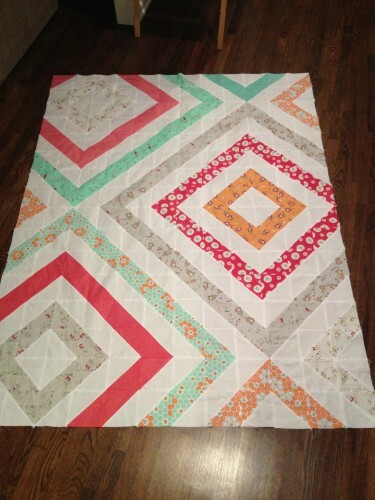 Once I get the quilt sandwiched and quilted, I’ll get much better pictures! How’s your summer been? What are you up to? Anyone else loathe applying sunblock to their children as much as I do??? 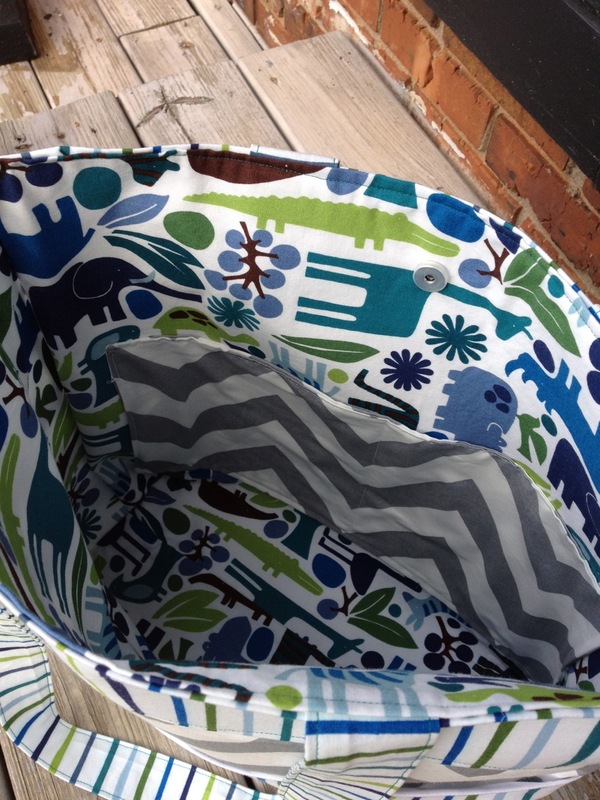 A friend of mine asked me to make a car seat tent for a friend having a baby. She had a few extra dollars to spend and what did I think I could make for the rest of her money? 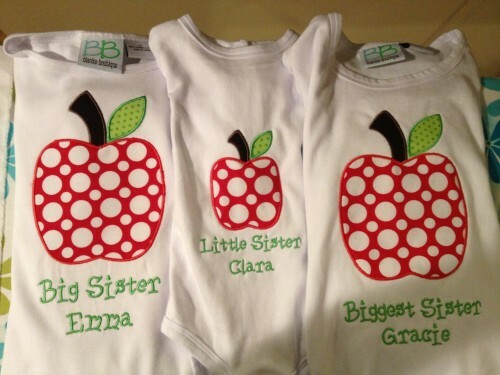 I threw some ideas out there – burp clothes, bibs, a dress, a tote bag. WAIT! STOP! A tote bag? Sure. And could it have lots of pockets? Sure. And could it have one for a bottle? You bet. And did I think I could coordinate the bag with the car seat tent. Definitely. And a pair was born! At the last minute I was going to change that chevron to another chevron that I’d ordered online but I hated the fabric when it arrived. I even went to the big box store and bought some home dec fabric but when I got home, I had to go with the grey chevron. That’s what was stuck in my head and there was no going back. I love that this project was for a boy. I love boys. That sounds so wrong but I feel like so much of what I make is for girls. 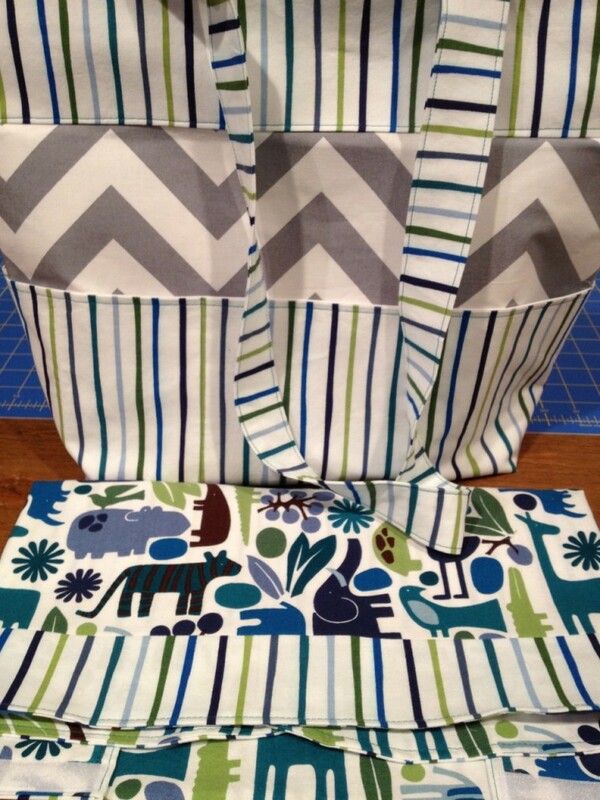 I also loved that I was able to incorporate the car seat tent fabric into the bag to round out the project but not make the bag to kid-like. This bag has EIGHT(!!!) 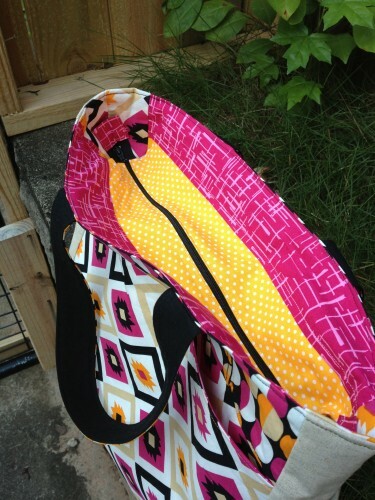 pockets – 6 external and 2 inside. You can’t tell from the picture but the stripes on the bottom of the bag are actually 3 pockets. POCKETS!! 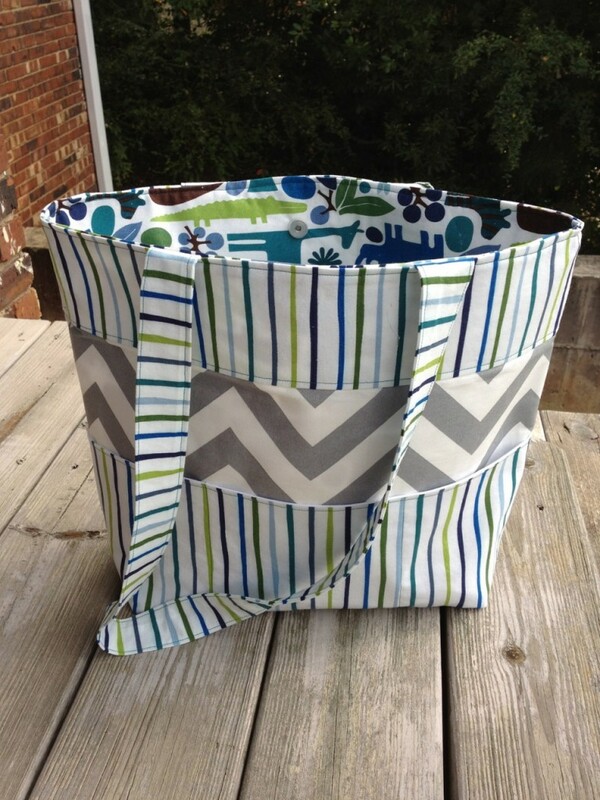 Who doesn’t love a bag with a million pockets??? I certainly hope the mom-to-be loves it as well! !